There are a few things that should be in every girl's closet. A checklist if you will. I've talked about this in a previous post that was all about investing in your wardrobe. If you missed it, definitely give it a peek for my scoop on what is what and why is why. One thing I mentioned was a meaningful piece of jewelry. For me that includes a necklace my dad gave me when I was younger and a gold bracelet that used to be my grandmother's. Another was a gold watch that my dad had essentially got over and stopped using. It didn't really have any meaning at the time other than Mary-Kate and Ashley were my end-all-be-all and oversized gold watches were trending because of them. I wore it constantly. Funnily enough, the thing didn't even work! Old battery I suppose. But since then, watches have held a sappy little corner of my heart. Accessorizing should be done in a tasteful way. 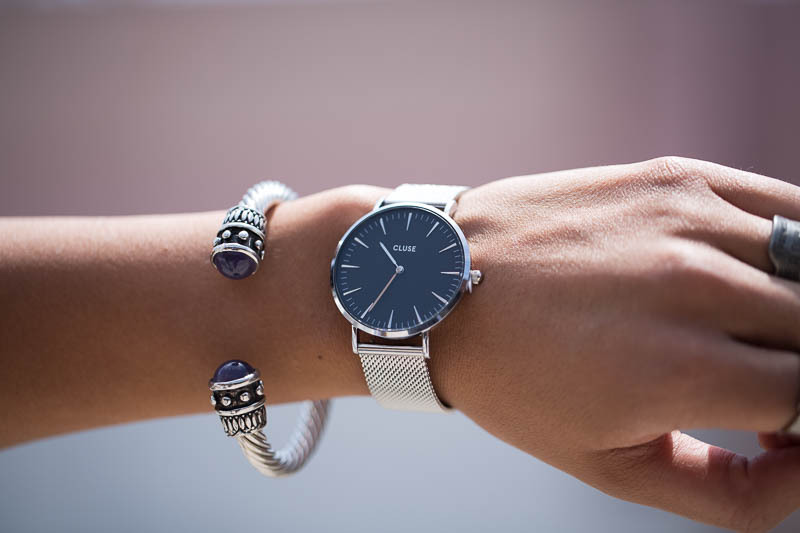 Much like belts, watches can tie a look together. I was really drawn to this watch by Cluse for a couple of reasons. Silver goes amazingly well with white and denim plus I thought the black dial was such a great contrast. But it doesn't end with just a watch. That's like saying you just want one scoop of ice cream- we're better than that. To add to the look, I like to pair watches with one or several bracelets. Variety is key so make it a mix of thin and chunky ones. For this look I opted for one bracelet and a couple of rings. Also don't be afraid to mix metals. This time I went the all silver route, but if your rings and belt buckle don't all match- that's fine! You're in the metallic family and they compliment each other. So there it is. Why I have a special love for watches because they remind me of my dad and Mary-Kate and Ashley. Kind of a bizarre reason; but, it's my bizarre reason. Love this look with statement pieces! The boots are gorgeous! Lovely watch, funnily i used to have watches all the time as a kid but i dont think i own one now! Just discovered you blog and I'm blown away by it! I'd love it if you checked mine out! Oh me like the lust list! love love this.